At the gateway to the US capital, the Potomac Yard complex in Arlington, Virginia encompasses 2.5 million square feet of office space, 1,600 new residential units, and 188,000 square feet of restaurants, shops, and services. Potomac Yard blends a careful mix of uses with thoughtful open space, parks, and high-quality street retail. National Gateway is the centerpiece of the Potomac Yard complex with office, retail, and residential construction. Arlington County is one of America's strongest office markets, with a base of eleven million square feet leased primarily to government agencies and government contractors. National Gateway is conveniently located in Arlington County, only five minutes from Washington DC, and provides close proximity to the Pentagon and Reagan National Airport, as well as many successful companies such as Boeing, Raytheon, Northrop Grumman, PBS, and Booz Allen Hamilton. The Environmental Protection Agency (EPA) recently signed a lease for 420,000 square feet to start the first buildings at Potomac Yard. 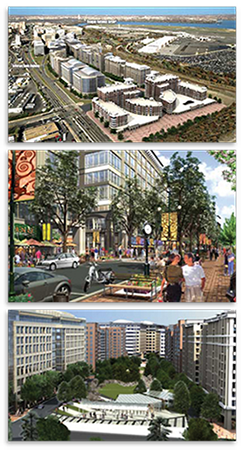 National Gateway is one of the few mixed-use projects inside the Metropolitan DC Beltway able to accommodate large corporate users in a location that is visible, accessible, and convenient for both tenants and their clients. Peter Haber from Pritchett Controls was instrumental in winning Phase I & II at the National Gateway at Potomac Yard in Arlington, VA. The new construction project has a total of six phases which we will pursue. Phases I & II consists of software and approximately 600 VAV boxes and controls for an estimated 20 Air Handler Units. National Gateway I and II are located near the main entrance to the Jefferson Davis Highway and adjacent to south-end retail and residential areas, and Center Park. The modern, clean look of the building with subtle nods to the art deco period provides outstanding architectural interest yet promises to remain a classic throughout the years. National Gateway I and II are both 9 storeys, 23,564 and 22,632 square feet respectively.